It's no secret medical staff are stretched beyond belief but now one Swedish midwife has revealed the shocking reality of an understaffed maternity ward in a candid post which she hopes will kick her government into action. Periods aren't fun at the best of times but can you imagine not only having to deal with the natural side-effects of the time of the month but the embarrassment of leaking onto your clothes - those clothes being your work uniform when you're on shift - too? That's the unfortunate situation Swedish midwife Petra Vinberg Linder recently found herself in when her ward was overstretched and understaffed, meaning she had no time to change her sanitary item. Considering it's a two-minute job, you can imagine just how rushed off her feet she was. It also shows just how dedicated the 40-year-old is to her profession and duty of care. 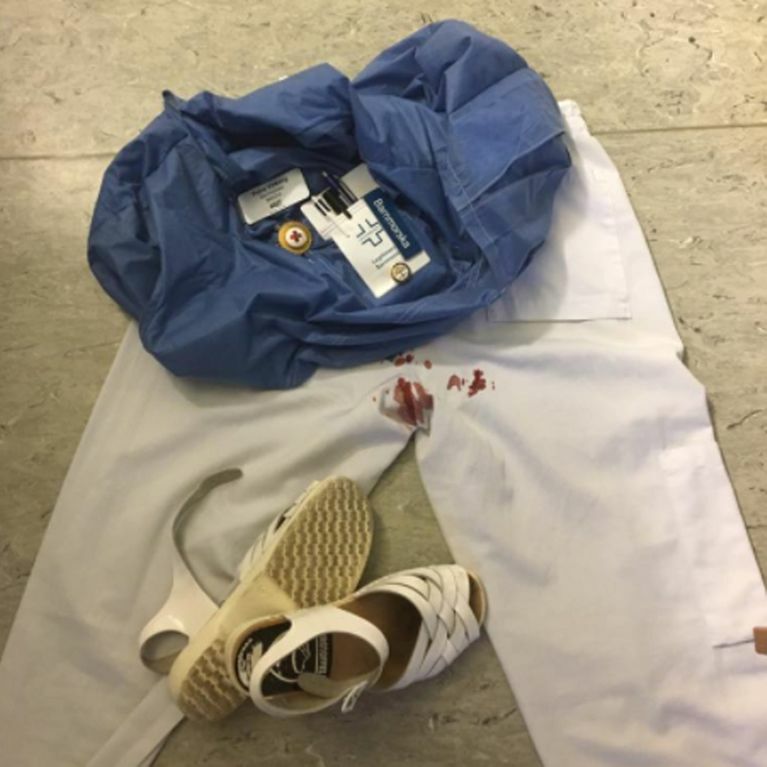 Linder - who'd been working on the ward at a Stockholm hospital for a week before this shift - shared a candid photo of her period blood-stained scrubs on Facebook to highlight the desperate need for more midwifery staff. She captioned the image: "Nattbarnmorska = 3 deliveries. Then you don't have time to pee or change your medical. Thank you and good night." Her period had leaked through her knickers and onto her bright white trousers after she was too busy helping deliver three babies to run to the toilet to change which is ironic as hospitals are meant to be sanitary places. Sharing details about the night shift in question, Linder revealed all hospitals in the capital were full so much so staff were having to refer women to wards further away in different counties. Pleading with the Swedish government, Linder told Huff Post UK: "We want and need more maternity staff. Now." She insists she loves her job despite its "difficult" nature and the unpleasant working conditions but is anxious whether she'll be able to work until the national retirement age of 65 as rough nights such as this one take their toll, adding: "We must have one more clinic. Midwives are tired."